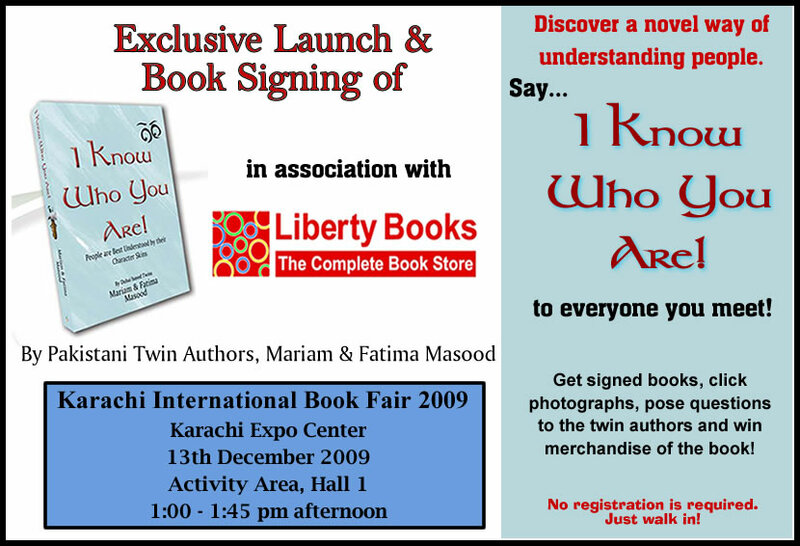 Liberty Books presents the Exclusive Launch & Book Signing Event of the novel, I Know Who You Are! by Pakistani twin authors, Mariam and Fatima Masood, during the Karachi International Book Fair 2009. Be at the Karachi Expo Center, Activity Area, Hall 1 on Sunday, 13th December 2009 between 1:00 -1:45 pm in the afternoon. Get a chance to meet the authors, click photographs, ask questions and win the merchandise of the book. Let your family, friends and associates know as well. It is great to share an important piece of information with all of you. Our first novel titled ‘I Know Who You Are!’ is currently being published in the United Kingdom. It will be available in book stores in the UK and the UAE in spring 2009. You can take a get to know more about the book on its official website. Do post in any comments, especially your opinion about the concept of Character Skins.